Join the discussion on our forums! Come discuss Fluffy Genie over in our dedicated Fluffy Genie discussion topic. Crystalsmith Kangor + Blackguard + Benevolent Djinn ? Maybe good calls from Master Oakheart? Not so great, but good. I just realized this is blatant power creep. Compare to Earthen Ring Farseer, a card still used in control warlock. If it is not removed, you continue gaining health, and when combined with buffs or for instance Righteous Protector it's very likely you'll gain at least 6 health from a 3 mana minion. Additionally, more synergy to Blackguard, a card I'd like to play more but never seemed to be that effective. A solid 3 damage to a minion seems like it will give you a similar board stance as Despicable Dreadlord, as your opponent has to remove it or else it will continue chipping away at their minions. This is decent card but paladin needs op cards. Duskbreaker should have been for paladin. 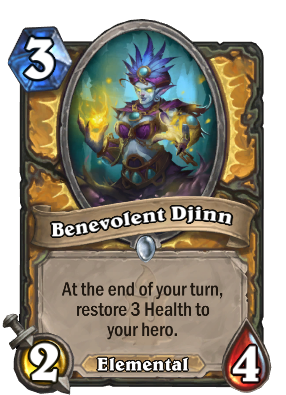 this could easily be 3/4 stat, considering how bad the healing effect is and how badly paladin need good cards. why the hell is it elemental ?? Ragnaros is a fire elemental. Now this. Thx bliz. So creative. Not earth shattering, but not terrible either. It could make for a decent backup behind Wickerflame Burnbristle against any other shielded minions since lifesteal doesn't heal when hitting a divine shield. I like this card since there is nothing wrong with it at all. It has a good stats for its cost. It has a good effect for its rarity. It suits both well in control and midrange (also Buff decks, since they lack healing because you don't play spells. It doesn't make Prince unplayable). It's a nice arena card because of its well rounded stats for its cost as mentioned AND it's common rarity. Its effect is a bonus. They give Paladins better weapons than Warrior and now better healing than Priest. Paladin is going to be wrecking Arena this season. Wasn't it just always like this? An Armorsmith that guarantees 3 health. And one more attack makes it better for trading. Plus all the buffs paladins have to keep this alive. Related to Fluffy Fiery Warrior?